Wandering through a bookstore one day, my attention was caught by a work with an intriguing title: Memoirs of a Fortunate Jew. It was written by an author, Dan Segre, with whose name I was totally unfamiliar. Perhaps I took notice because I knew that the name Segre was Italian; and I had for a long time been struck by the differences between the anti-Semitism of Mussolini’s Fascism and that of Hitler’s Germany. Why had the Italian variety been so much less severe and fanatical? I bought the book without anticipating that I would not be able to put it down. Why did the book strike me so forcibly? It is beautifully and sensitively written, but more importantly it traces the author’s remarkable journey from the very heights of Italian Fascist society to a kibbutz in pre-Israeli Palestine, and finally back to his native land as an officer in the Palestine (Jewish) regiment of the British Army. One of the chapters is entitled “My Jewish-Fascist Childhood,” and the combination of these two adjectives best expresses the extraordinary nature of the circumstances that Segre evokes. 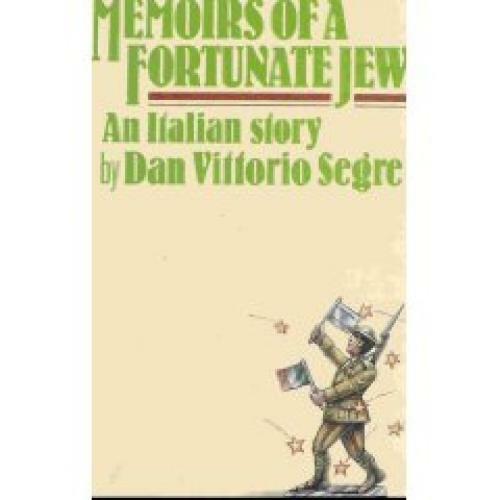 Dan Vittorio Segre was born into a Jewish family in the Northern Italian province of Piedmont, and he briefly sketches the unusual history of the region’s Jews. Many of them had participated in the Risorgimento, the movement for Italian national unity in the nineteenth century that brought the House of Savoy to power; in some sense these Jews were more Italian than the Italians because they had no local or regional loyalties to overcome. As a result, Segre writes, they could “integrate into the Gentile society more quickly and more deeply than in any other country, including the United States.” No other country had ever appointed a Jewish war minister, and two Italian prime ministers had Jewish origins. It was only natural that the son should have accepted Fascism “as the only natural form of existence,” joining Fascist youth organizations and participating in them whole-heartedly. “I do not remember,” he writes, “either in school or outside one single occasion when I felt uneasy because I was a Jew.” His family assimilated completely, without renouncing its Jewish origins. (An aunt converted to Catholicism on marrying a Gentile; and Segre’s mother, publicly converted much later, lies buried in a convent in Israel.) But for the young Segre, being Jewish only meant that he was freed from attending the otherwise obligatory class in catechism. About Judaism he asserts knowing little or nothing, though he attended Talmud Torah classes once a week to prepare for his bar mitzvah. His memories include his father reading aloud the story of Jonah on the afternoon of Yom Kippur, and the family eating matzah during Passover (the servants were carefully furnished with bread), and a special cake baked by his maternal grandmother at Purim. There was also an episode in which the family attended Yom Kippur services and his father repulsed intruders into the synagogue by displaying the document revealing his high position in the Fascist party. Looking back on his past, Segre can only marvel at his own innocence and ignorance. Neither the invasion of Abyssinia nor the Spanish Civil War had the power to penetrate his carefully sheltered and comfortably opulent Italian Fascist world. It was only in 1939, in a Palestinian kibbutz, that he first “heard socialism mentioned as a political reality.” The existence of anti-Semitism was not unknown, of course: a branch of the family lived in Paris, and he heard faint echoes about the Dreyfus affair from his father, but to the carefully coddled young man they “sounded like the deeds of Genghis Khan or Attila.” The anti-Semitic component of German Nazism was openly disapproved of by all of his father’s Fascist friends and his own school comrades. One can well imagine the consternation in this milieu when anti-Semitic legislation was unexpectedly introduced in Italy in 1938. The Jewish community was in effect excluded from Italian society. Suddenly Jews were strangers in a land which, they had once felt, guaranteed them a security felt nowhere else. Segre’s father had been violently opposed to the idea of Zionism, which he saw as a competing with Italian nationalism. But Segre rudely awakened to political reality, and decided that he wished to immigrate to Palestine. “I thought . . . that the best place to go would be where nobody could reproach me for the crime of having been born a Jew,” he writes. By this time Segre’s father not only consented, he frantically urged his son to quit Italian soil. The money for his trip, to be illegally deposited in an English bank, was arranged through the Fascist party chief in Turin. Segre’s later chapters, which deal with his bewildering encounter with Israel, are fascinating. They provide an engrossing picture of the ferment, both personal and intellectual, that the hitherto sheltered Italian youth encountered. He struggled to absorb all the astonishingly new ideas being endlessly discussed in streets and cafes. Sleepless nights were spent pondering arguments and disputations, on which agreement was never reached, “on how to defend the Jewish people, how to contribute to the war effort, how to win over capitalists to Marxism, how to deal with the Arabs, how to convert the British to the idea of a Jewish state, how to exploit the need of the Allies for our cooperation, how to create a new type of Jew in Palestine.” These chapters are filled with indelible portraits of the striking and sometimes disturbingly eccentric individuals that crossed young Segre’s path, some of whom had come to Palestine out of idealistic conviction and others only seeking to escape from oppression. The book ends with an episode that recalls The Third Man. Segre is with his regiment in Bari, recently taken over by the Allies, where he notices an attractive woman that he does not have the courage to approach. But then he sees tears in her eyes, and inquires in Italian if he can help. She replies that her four-year old daughter is ill with meningitis, and that a doctor has told her of a new medicine called penicillin that might provide a cure. Segre takes Francesca (they only exchanged first names) to the Jewish Soldiers’ Club, in the hope of obtaining some information, and is told to go to a hospital in the next town and to ask for a nurse with a Jewish name. Dan Segre became an Israeli diplomat, a press attache in Paris, and for a number of years he was the head of the overseas service of the Israeli broadcasting station Kol Israel. He has written several other books, one of which (Memoirs of a Failed Diplomat), recounts this later career, which eventually led him to academia. Alas, I only learned he had spent some time at my own university, Stanford, shortly before I arrived. He is now head of the Institute of Mediterranean Studies in the Italian Swiss University of Lugano. Unfortunately, Google was unable to inform me whether he is still teaching. But if he is, and I were a student, I would take the next train, plane, or boat to Lugano. Joseph Frank has just published Dostoevsky: A Writer in His Time, a condensed version of his five-volume work.